Comprising both 4x4 and 6x6 models, the Trakker is a rugged off road truck, purpose-built for tough off road applications. Boasting the traction of an all-wheel drive 4x4 and 6x6 driveline, suspension providing superior articulation with excellent load carrying abilities and powerful yet efficient Cursor engines, the Iveco Trakker makes light work of the toughest conditions. Recently introduced to the range is a new 4x4 variant with 18 tonne GVM and 44 tonne GCM* and Cusor 8 engine with 360hp coupled to a ZF 16-speed manual or optional Eurotronic II 12-speed automated manual transmission. Other benefits include differential locks and hub reduction on all axles. The 4x4 joins the existing 6x6 models which feature the well-regarded Iveco Cursor 13 450hp engine, coupled to the Eurotronic II 16-speed automated manual, which provides easy, stress-free driving allowing the operator the freedom to concentrate on the road conditions. With 33 tonne GVM / 50 tonne GCM, the Trakker 6x6 is ideal for applications requiring a higher payload or greater volumetric load. 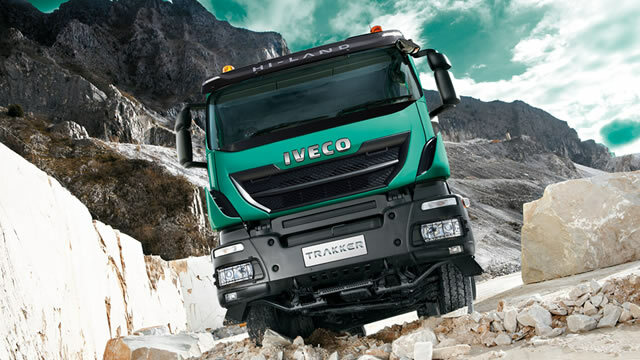 The Trakker 4x4 is powered by Iveco's versatile Cursor 8 – 6 cylinder, turbocharged diesel engine. The 7.8 litre powerplant produces 360 hp (265 kW) and 1106 Ib ft (1500 Nm) of torque ensuring plenty of power for the application. The larger 6x6 variant makes use of the popular Cursor 13 - 6 cylinder, turbocharged diesel engine. Packing 450 hp (336 kW) and 1620 lb/ ft (2200 Nm) of torque, the Trakker has ample power to conquer the most demanding jobs. To meet the current Euro 5/ADR 80-03 emission standards, both engines are equipped with Selective Catalytic Reduction (SCR) technology which reduces the level of toxic gases emitted from the engine and also provides a significant decrease in fuel consumption. In the case of the 6x6, paired with the engine is the durable and intuitive ZF Eurotronic II 16-speed automated transmission. The sensors measure throttle response, road surface and inclines to select the correct gear at the right time. The 4x4 is equipped with a ZF 16-speed manual transmission or can be specified with an optional ZF 12-Speed automated manual. Iveco has equipped the Trakker range with high quality proprietary componentry plus the best from leading equipment suppliers such as ZF. Resulting in a range that is ideal for the most demanding jobs both on and off the blacktop. The Trakker 4x4 is powered by Iveco's versatile Cursor 8 – 6 cylinder, turbocharged diesel engine. The 7.8 litre powerplant produces 360 hp (265 kW) and 1106 Ib ft (1500 Nm) of torque. Power for the 6x6 comes courtesy of the Iveco Cursor 13, 6 cylinder, turbo charged engine. With 450hp (336 kW) and 1620lb/ft (2200 Nm). To meet the current Euro 5/ADR 80-03 emission standards, both engines are equipped with Selective Catalytic Reduction (SCR) technology. Paired to the Cursor 8 engine in the 4x4 model is a ZF 16-speed manual transmission engaged via single dry plate clutch. As an alternative, Iveco’s Eurotronic II 12-Speed automated transmission can also be specified at additional cost. Coupled to the Cursor 13 in the 6x6 Trakker is the ZF Eurotronic II automated transmission. The unit is a 16-speed transmission which has an electronically controlled clutch engagement. While driving in automated mode the Eurotronic transmission automatically selects the most ideal gearshift according to load, road speed, road incline, etc. The transmission also provides the operator with the flexibility to manually select gears should the application and track conditions require this. 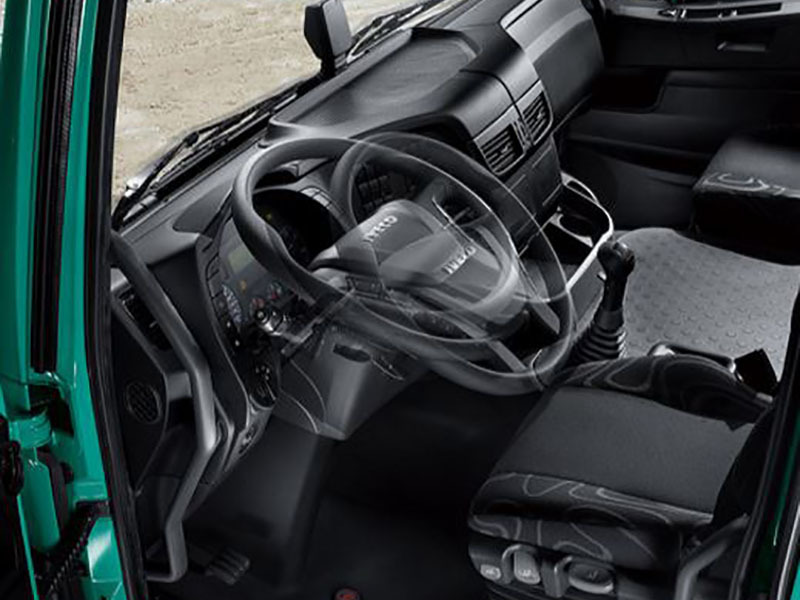 Manual gear engagement is simple via a touch on the gear selector as it also is in the 12-speed automated manual available in the Trakker 4x4. The result is an intelligent and adaptive system, which helps to reduce stress levels and fatigue for drivers with the added flexibility of being able to be used in both automated and manual modes depending on the conditions at hand. The Iveco Trakker is a genuine off road vehicle, with permanent all-wheel drive to all axles. The Trakker is fitted with parabolic leaf springs, anti-roll bars and shock absorbers on the front suspension, while the rear suspension is an Iveco Cantilever setup in the 6x6 and parabolic leaf springs in the 4x4 - it's a powerful combination that strikes the right balance between vehicle articulation, load carrying ability and comfort. The Cantilever suspension encompasses a reinforced anti-roll bar and shock absorbers, ensuring a smooth ride over the roughest terrain. In the 6x6, the front suspension has a load capacity of 9 tonnes and the rear suspension has a capacity of 26 tonnes, with the strength to handle extremely heavy loads over tough conditions. Capacity in the 4x4 is also generous with an 8 tonne front axle limit and 13 tonnes in the rear. The Trakker models have a strong high tensile steel chassis, which is completely flat and free from obstructions, making it easy to work with for any body builder and allowing fitment of a wide array of body types. The high tensile construction also allows for chassis twist providing for superior articulation and stability over uneven terrain.